JOSLIN – O – RAMA! “Devil’s Kiss” by Jared Joslin. Oil on canvas, 24 x 36 inches, price upon request. Hooray, Molly! Hooray, friends! Hooray, backers! Hooray AAAHHHRRRT! 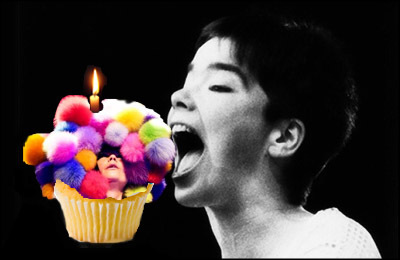 Filed under Animation, Better than coffee, Crackpot Visionary, Dance, Faboo, Fairy Tales, Flora & Fauna, Grrrl, Music, Personal Style | Comments Off on BTC: Happy Birthday, Björk! Guest Curator of the Cute & Creepy exhibition, FSU Museum of Fine Arts. Drive past enough hazy bayous and bent oaks, sacrifice enough November butterflies on the altar of your windshield, and you’ll find something creepy in the heart of Florida. 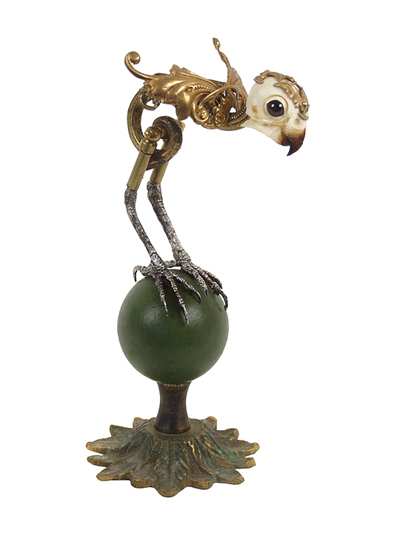 Carrie Ann Baade has collected the works of 25 fellow artists- works of beautiful, grotesque, adorable art- for the Cute & Creepy exhibition that’s currently taking Tallahassee by storm. Over two-thousand people attended the opening- four times more than any other opening at the museum thus far, and some strange lure continues to draw unprecedented numbers to this show- a lure as hard to define as the subject of the show itself. 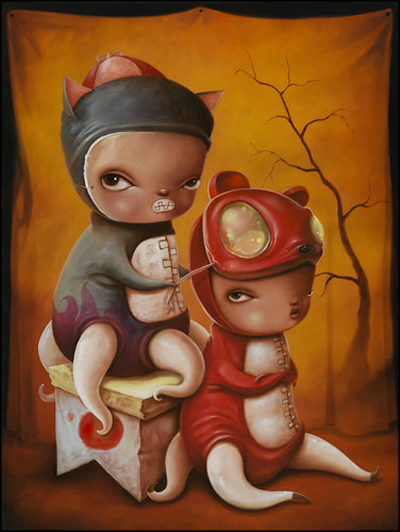 Cute & Creepy is an exploration of boundaries, but the artworks on display do not so much “cross the line” as seem unaware that any boundaries exist. Each object is wholly itself; it is the viewers for whom categorization fails. Toddlerpede 2.0” by Jon Beinart. 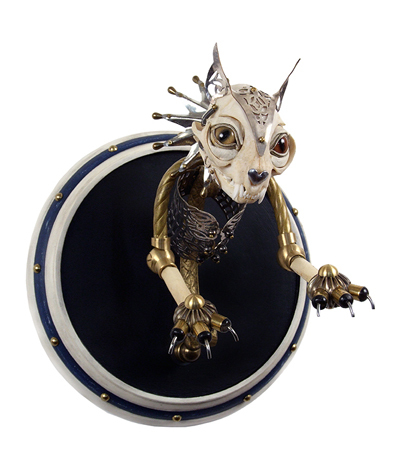 2011, mixed media sculpture, approximately 36”x36”x36”. Photo by Caroline E. Willis. Via Lana Guerra. Thanks, doll! A backstage peep at photographer Tim Walker’s phenomenal ‘Mechanical Dolls‘ editorial for the October 2011 edition of Vogue Italia, featuring models Audrey Marnay & Kirsi Pyrhonen. Brilliantly styled by Jacob K. — a truly breathtaking amalgam of outmoded automata and puppetry, paired with delicate vintage French, British and Japanese garments. Make-up by Val Garland, hair by Malcolm Edwards. Photo by Tim Walker from the “Mechanical Dolls” editorial, Vogue Italia, 2011. Directed by Richard Elfman, TFZ stars real life ex-lovers Hervé Villechaize and Susan Tyrrell (who steals the show with the above number, which she wrote the lyrics for herself!) along with various members of the Mystic Knights of the Oingo Boingo. TFZ also features the first full-length film score by Richard’s younger brother, Danny Elfman, along with Warhol Superstar Viva, B-movie maniac Joe Spinell, performance art duo the Kipper Kids, and the pioneering street dance troupe, The Lockers. Made on a shoestring over the course of three years in the early eighties, TFZ is “basically a filmed version of what we were doing on stage with the Mystic Knights of the Oingo Boingo,” Richard Elfman said when Coilhouse interviewed him last year. “As the group was becoming less ‘theatrical’ and more rock based, I wanted to preserve on film the essence of what we had been doing on stage.” Elfman’s final cut is reflective all of the funniest, weirdest, most brazen and poignant attributes of ‘Boingo. You can read all about this subterranean cult classic in Issue Six of the magazine, which will probably sell out of our web store pretty soon, so don’t put off buying your copy if you want to learn more about the on and offscreen adventures of Queen Doris, King Fausto, Squeezit Henderson the Chicken Boy, Frenchy and Renee. This week’s BTC is dedicated to two darlings: firstly, to our brave and steadfast Circulation Director, Gretta Sherwood, who will be mailing off thousands of copies of the magazine over the coming weeks, and secondly, to Wiley Wiggins, who got Coilhouse a quote from Queen Doris herself for the magazine article. Gret and Wiley are both celebrating birthdays this week! Big love and gratitude to each of you beauties. Bejeweled octopus centaurs, birdwomen and mermaids. 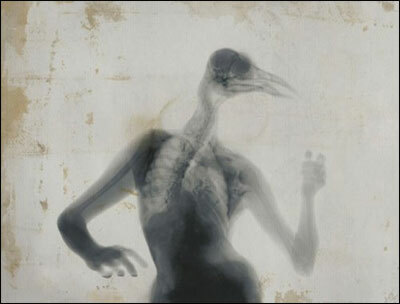 Tumblr oldies but goodies, these fantastical x-rayed hybrid human-animals are the work of Italian artist Benedetta Bonichi. More of her work can be seen at her website, To See in the Dark. 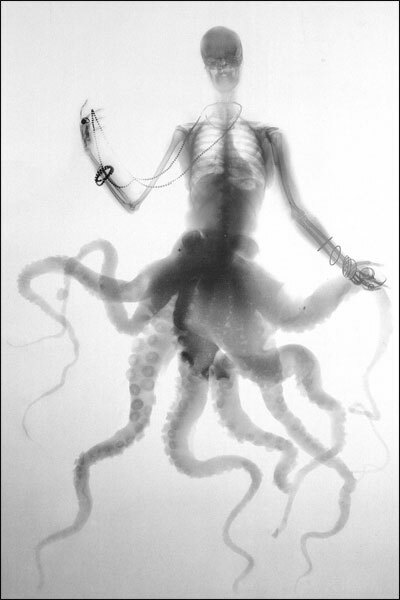 If you like Benedetta’s work, check out these gorgeous corset x-rays from 1908 and the raunchy 2001 x-ray art (NSFW!) 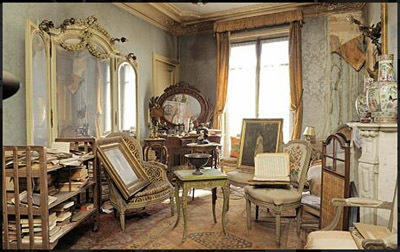 of Wim Delvoye. La collana di perle, 2002. Good morning! Guess who’s heading back to Middle Erff today? It’s gonna be a long and difficult journey. Luckily, I’m bringing along plenty of light reading material, tasty snacks, and this version of Erwin Beekveld’s “They’re Taking the Hobbits to Isengard”, which should keep me (and you!) entertained for, oh, I dunno… ten hours? Or not. Have a great week, lovelies. Mission most fully and beautifully accomplished, good sir. And the world still misses you very much. But we’ll keep believing, keep pretending. 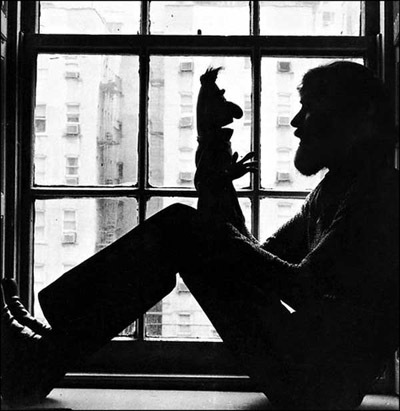 Happy 75th birthday, Jim Henson.